David Hunt Lighting Doreen 15 light ceiling fitting displays a very stylish and contemporary update to the traditional Flemish style, as can be seen in the long, elegantly curving arms and the sleek, ridged design of the central baluster and candle holders. 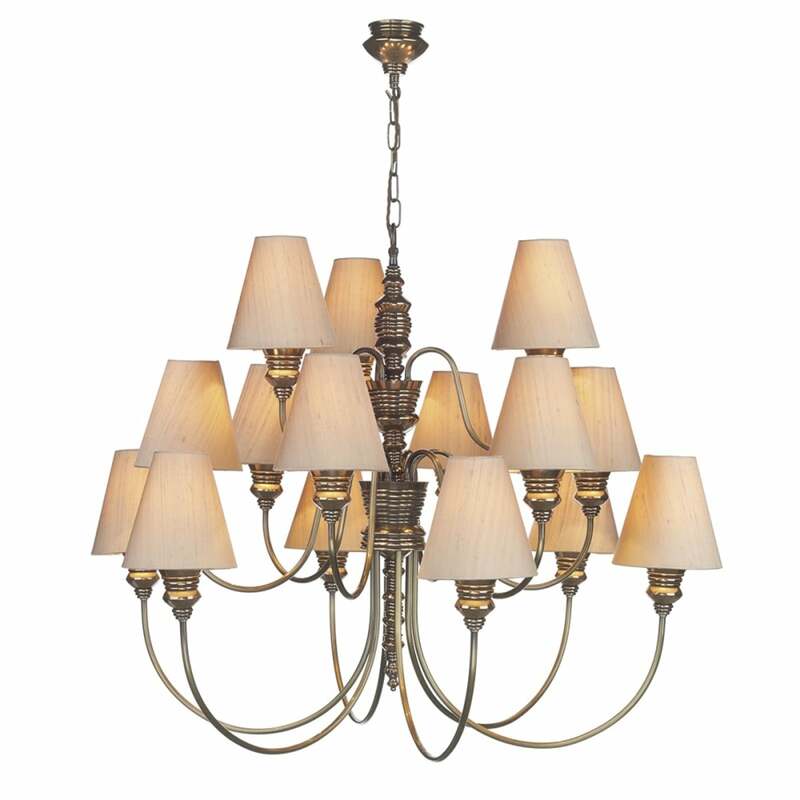 The product code for this David Hunt chandelier is DOR1500. The bronze finish completes the classic look and the taupe silk shades emit a warm glow when illuminated for a touch of modern glamour. A bold, dominant fixture that is sure to inspire and enhance contemporary surroundings. David Hunt have a variety of shades available in 12 silk colours, with a choice of a white laminate or gold, silver and bronze metallic linings. Height adjustable at the time of installation and due to its large three-tiered frame, is ideal for large, open spaces with high ceilings. A striking item that is also available as smaller 5 and 9 light chandeliers and a 2 light wall fitting. These fixtures are also available with pewter and distressed cream finishes. Please see our website for the entire collection.